In October 2016 I got a wooden kayak kit. In February 2017 it finally hit the water! It took a little longer than I expected, but I’m happy with the result! Here I am taking it in the water for the first time. I worked from home this day and quickly left for the Santa Cruz harbor as soon as I was done. It was a dark and stormy day, but I still wanted to try paddling in it. Lexi gave me a hand getting it in the water, and I took off. The kayak handles awesome. This is the first time I’ve ever sat inside a kayak; all other times I’ve been on cheap plastic kayaks that are a sit on top style. This machine moves fast, and cuts through small waves without any effort. The storm was brewing a little too strong for me to leave the harbor, and I can’t wait to take it out again. 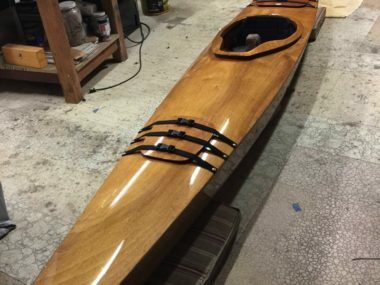 Chesapeake 16LT Kayak: Part 14 - Finished.